Neil Castle was over in the USA some six years ago. During his visit, he encountered a Mexican celebration day. “I’d not seen anything like the Dia de Muertos (Day of the Dead) festival until I was in LA, where there’s a sizable Mexican population. 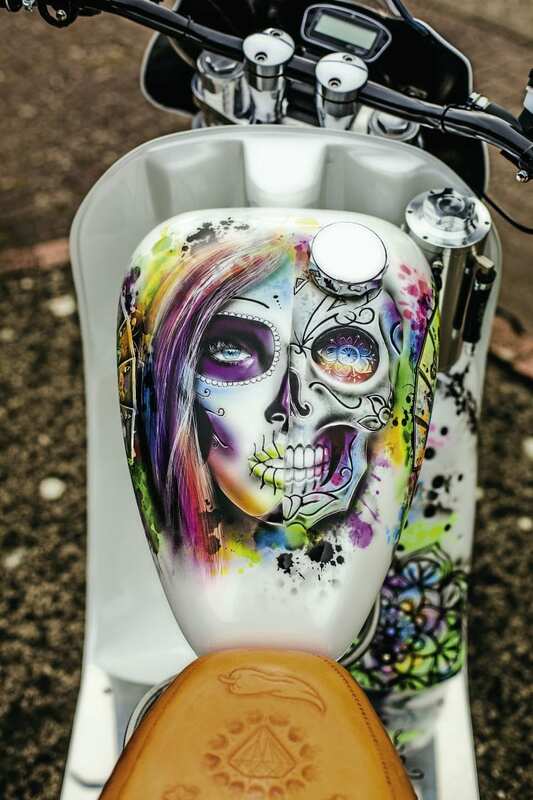 I can remember thinking at the time, that ‘Day of the Dead’ would make a good theme for a custom scooter. I filed the idea away until last year when I started working on what would become El Bandido. I’d had the idea to do a Vespa auto custom for a few years. “When I was more or less ready I scoured various places for a suitable machine to base the project on. I was all set to start right from scratch, then I happened upon a PX on Gumtree that had already had some work carried out on it, similar to what I was planning. Gilly Harris had started work on the frame having already done some extensive welding and modifications to the rear end as well as altering the fork stem housing to accommodate different forks. I think he (Gilly) had lost interest or faith, or both in his project. It had a nice shape and although I was prepared and capable of doing the work myself, having the frame how it was saved me a bit of hard work getting the scooter started. 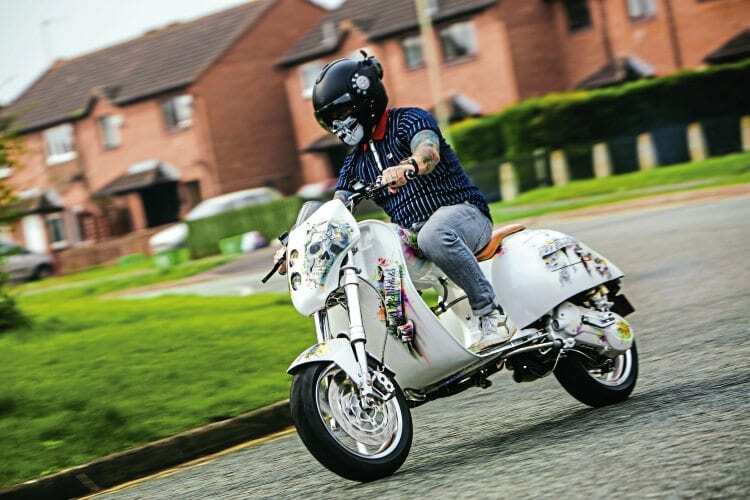 Neil, who rides with Cheltenham Blue Diamonds SC, is something of a serial custom scooter builder, having built a number of them over the years. He currently has two more following on fast behind El Bandido. 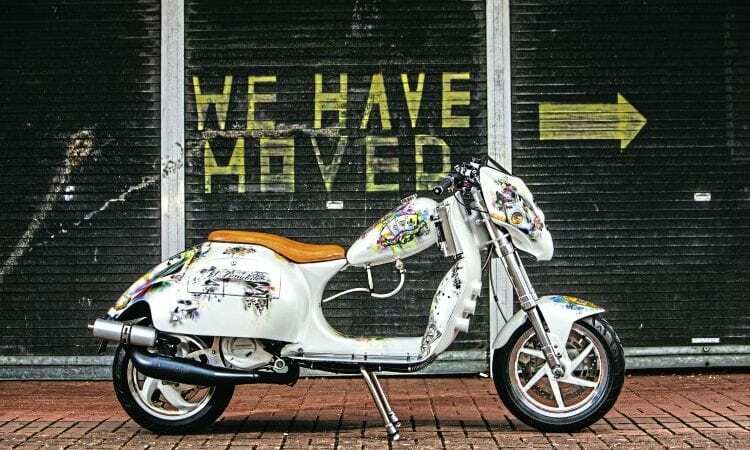 Both are Vespa customs. A different beast for sure. 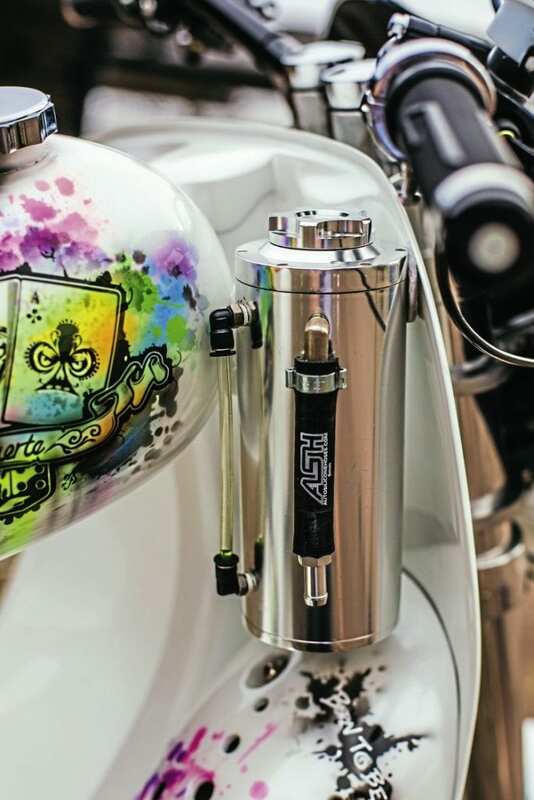 While Neil is a capable and accomplished customiser in his own right, he invariably farms out certain elements of his creations for specialised attention. El Bandido was no exception. For example, Mark Dainty at Wild Performance contributed more than a helping hand with the physical build of El Bandido. 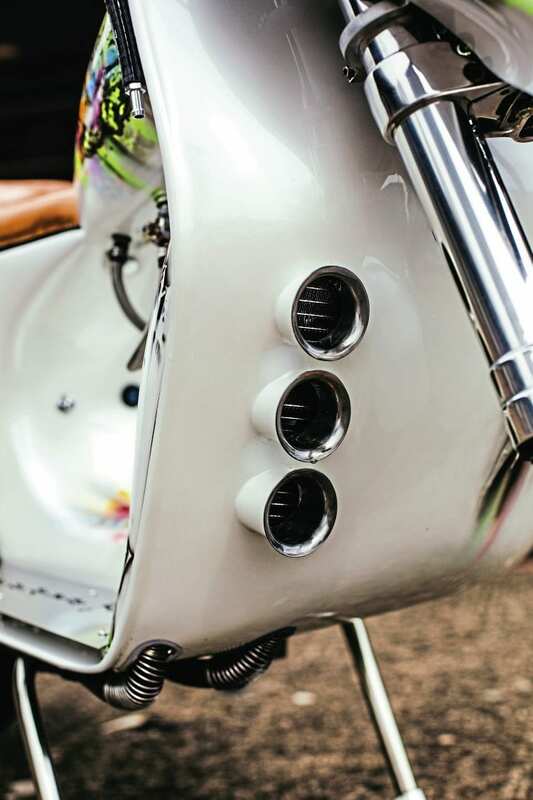 Other notable collaborators were Mark Eavers at Dave Barlow Engineering who provided required machined parts including among other items, a rear wheel to engine brace, which incorporates an exhaust mounting. Sourcing, setting up and fitting the forks was entrusted to the expertise of Bill at Performance Red. For the bespoke seat Neil turned to Gerry at Leathery Elephant, who delivered another superbly crafted one-off item. Powering El Bandido is a Gilera auto engine which has had a full on Readspeed upgrade. “It’s early days as yet, but I’m expecting a cruising speed in the region of 75-80mph, with a 100mph top speed. It’s got a 172 PM pro-street top end kit, long stroke racing crankshaft with upgrades all around to suit. 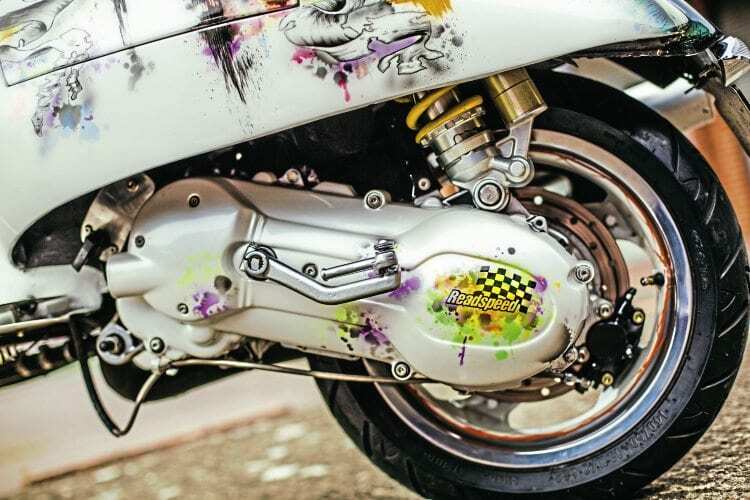 Jerome at Readspeed gave it an additional tune and set it up on a dyno, when I got the engine back it was complete and ready to drop into the frame.” Unusually for one of Neil’s projects, El Bandido took, by his standards, a marathon 12 months or thereabouts to complete. Was there any particular reason for how long it took, and what were the main issues that needed overcoming in the build of El Bandido? “I suppose me keeping on changing my mind wasn’t too helpful in how long it took overall. There were a few frustrating aspects involved in the build. Of the four main ones, braking was marginally the easiest to resolve. “While I’m confident in my own abilities to tackle most things, I hold my hand up to being hopeless when it comes to wiring. Mark at Wild Performance put a loom together from scratch. The exhaust system needed a bit of a cut and shut to fit around the engine and under the bodywork. 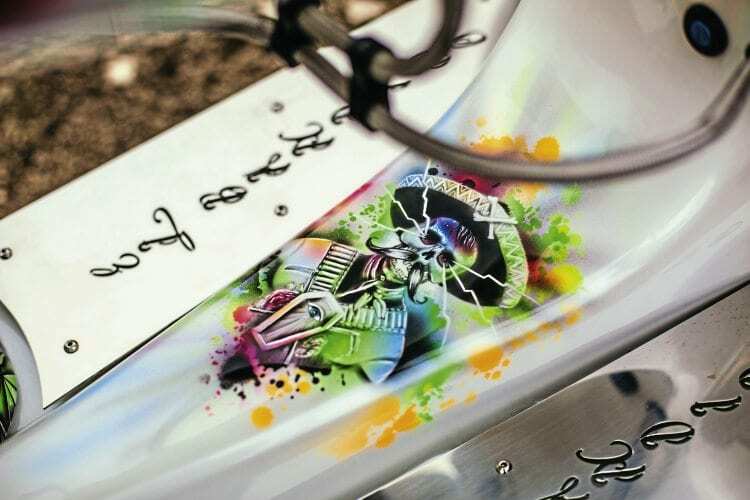 At the time that was done Mark had a couple of bike exhausts ceramic coated, which looked fantastic, so I had El Bandido’s done at the same place in Oxford. 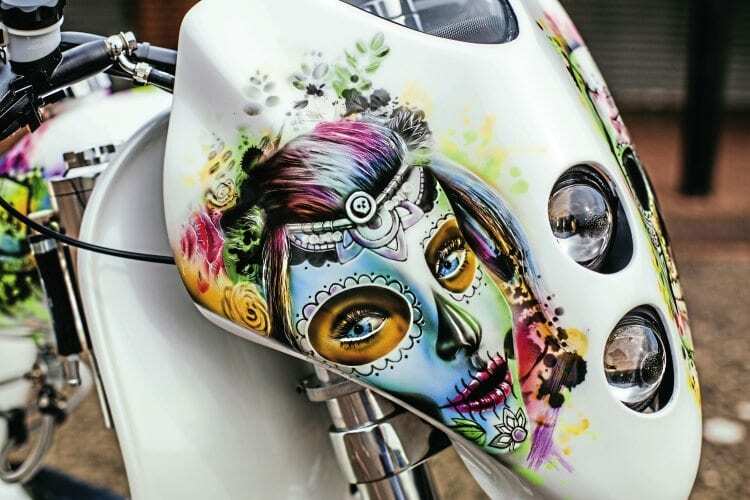 With its eye-catching murals (see below), trick items, some obvious and others which required a closer look, I’d say El Bandido is everything and more of what Neil set out to create when he first embarked on this custom project. El Bandido is genuinely unique to almost everything and anything else currently out there. 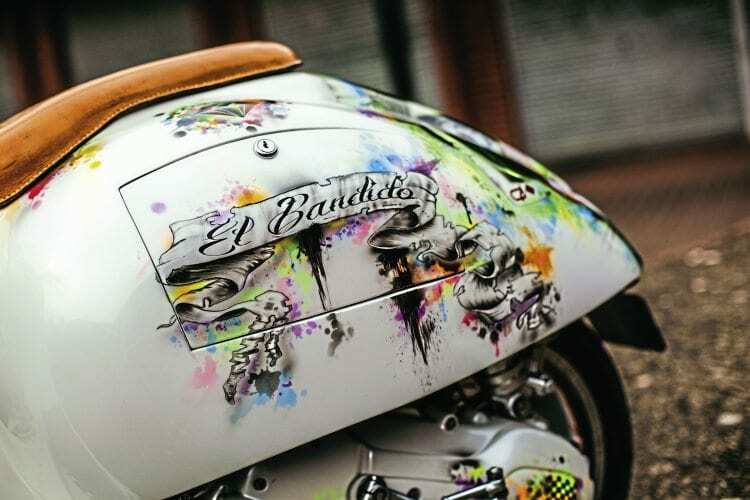 El Bandido is a radical looking machine, equally enhanced in the visual stakes by the stunning artwork and murals adorning the bodywork of the machine. These were jointly provided by the talented duo Sammy Cave (artwork), and John Tooze, who ply their trade at Reborn To Be Wild. Neil briefed them on the theme he wanted and gave them the background, they then ran with the idea. 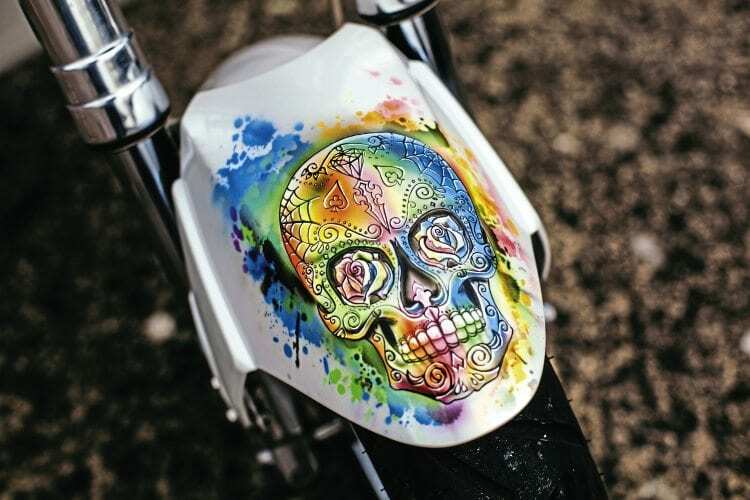 El Bandido’s theme is inspired by the Mexican (and Hispanic) Day Of The Dead: Dia de Los Muertos. The festival itself runs from October 31 until November 2. Since the last century, it has been elevated to National holiday status in Mexico, especially in central and southern areas. Since the turn of the Millennium, it’s been celebrated in most areas where Mexicans have settled, including the United States. The festival can be traced back to the time of the Aztecs, it mirrors similar events throughout the world that honour dead ancestors — for example coinciding with the Catholic Christian religious marking of All Souls and All Saints days. Children dress up in costumes, knock on doors and ask passers-by for caliverita, generally meaning a gift of sweets or money. Sugar or chocolate skulls are the main forms of caliverita given to children. They are also used to decorate the graves of ancestors. Over the three-day festival, there are speciality foods and drinks prepared and consumed in abundance, along with plenty of singing, dancing and general merrymaking. 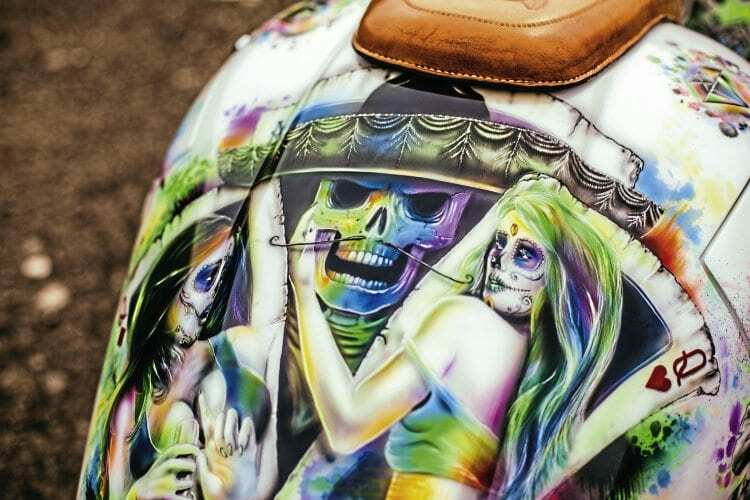 Drawing upon the Mexican festival, as witnessed first-hand by Neil some six years ago, along with other research into the subject, Sammy and John, using Neil’s hybrid creation as their canvas have created an absolute masterpiece to illustrate the name and theme of the machine. Town & club: Cheltenham Blue Diamonds. First interested in scooters: Always, dad had a GS (Vespa). Favourite scooter model: Any Vespa before ‘P’ range. Probably Vespa GS. Favourite style of custom scooter: Whatever I am working on or building at the time. First rally or event: Isle of Wight, 1982. How did you get there: Primavera! Favourite and worst rally/event: Always enjoy Woolacombe. Nor worst rally. Furthest ridden on a scooter: Northern rallies, 200 miles plus. What do you like about rallies: Piss up with the lads (social side)! What do you dislike about rallies: Twats in cars. Favourite Scootering feature: Custom bikes. 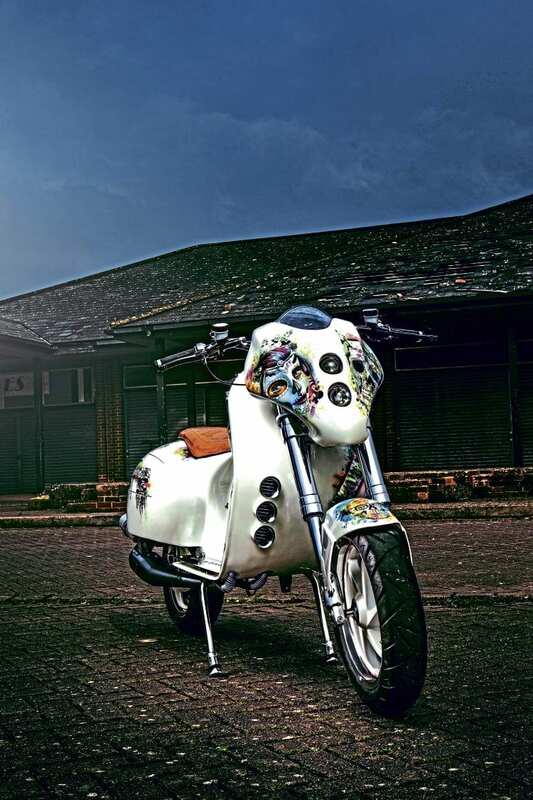 Favourite custom/featured scooter of all time: Liked Pride & Poverty Lammy in 80s. 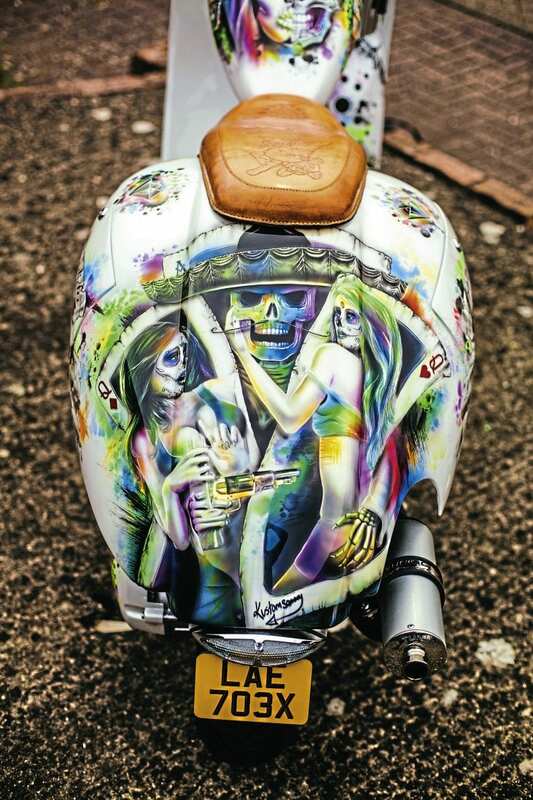 Also liked Lammy with coffin sidecar, think it was called the Undertaker (don’t know if it featured). Not a lot beats a standard GS though. If you had to recommend one scooter part or item of riding kit, what would it be: Headphones and iPod, all my bikes are noisy! Most useless part ever bought: Harley mirror for my Vespa, can’t see a thing. 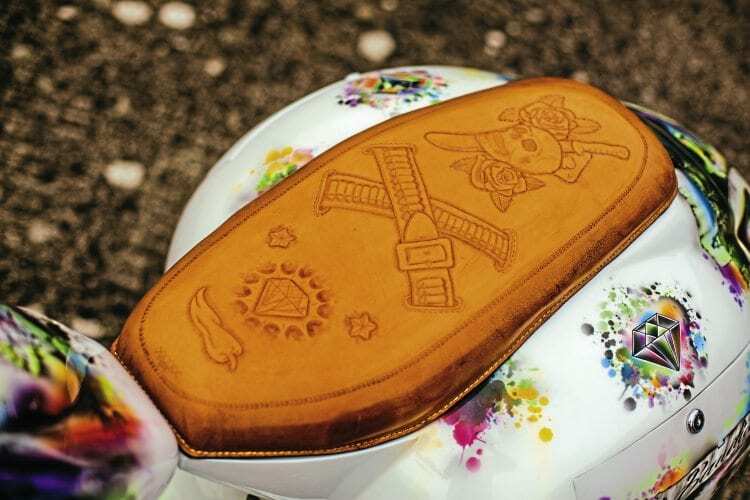 Name of scooter and reason: El Bandido. Thought Day of the Dead theme would be cool! Scooter model: Vespa PX/Gilera Runner. Date purchased and cost: September 2014 and it cost a good deal! Inspiration for project: Wanted to do a Vespa auto and found one part built. Time to build and by who: A year ish? Partly built by me, but with a lot of help from Mark Dainty at Wild Performance (mainly him to be fair!). Any frame modifications: Rear bodywork and welding already done by ‘Gilly’ Gilbert Harris. Machined parts: Mark Eavers at Dave Burlow Engineering. Further framework: Reborn to be Wild and Hyabusa front end. Specialised parts: Seat by Gerry at Leathery Elephant, rear wheel to engine brace with exhaust mount Mark Eavers, forks by Bill at Performance Red. Engine spec: Gilera Runner, Kit: PM Pro Street 172 kit, Crank: Top Racing 55mm Long Stroke, Carb: 25mm Dellorto, Exhaust: PM (adjusted to suit), Porting & Dyno: Jerome at Readspeed. Top and cruising speed: 100ish and 75/80mph. 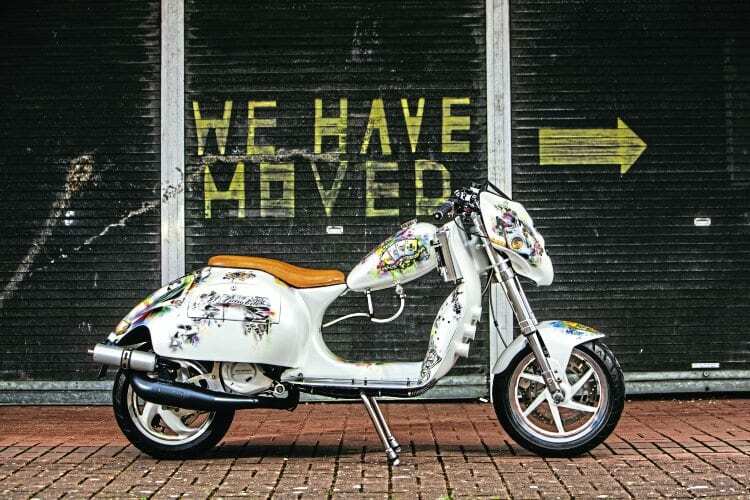 Looks: Paintwork and murals by Sammy Cave and John Tooze, Reborn to be Wild. Paint by John, murals/artwork by Sammy. Exhaust ceramic coated by Performance 1 Coating. Stainless steel floor runners – Melv’s Weld. Polishing by Tony at Perfect Polishing. Overall cost: Between £9000 and £10,000? Anyone you wish to thank: ‘Gilly’ Gilbert Harris, Reborn to be Wild, Gerry, Mark at Dave Burlow Engineering, Jerome and the guys at Readspeed and Mark Dainty at Wild Performance. Enjoy more Scootering reading in the monthly magazine. Click here to subscribe.